Double or Nothing yoyo trick video. 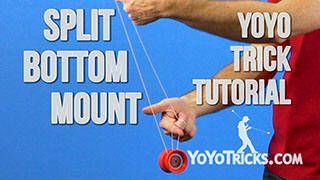 Double or Nothing Yoyo TrickIn this video I am going to teach you the trick Double or Nothing, and it looks like this. That dismount that I did there is the most common dismount for this trick, but at the end of the video I am also going to show you a few other dismounts just to make the trick a little bit more exciting. When you practice it you can get out of it a few different ways. 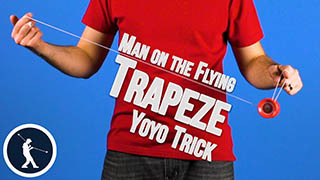 When you first start this trick, it starts off just like Man on the Flying Trapeze, with a Breakaway, except instead of just going over the first finger of your opposite hand and landing the yoyo on the string, what you are going to do is position your hands pretty close together, and you are going to allow the yoyo to go around both hands, and then you are going to let it go around your opposite hand one more time, and you want to aim the yoyo to land on the outside string. 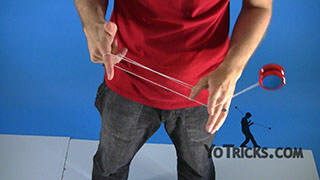 Chances are when you first do this trick you are probably going to land on multiple strings, you might even land on all three strings, so the way you can keep the strings separated is on the first pass make sure that you keep the string on the inside of your first fingers, and on the last pass keep it on the outside. 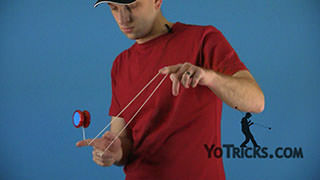 That way you can see there is a lot more separation, so it is easy to land the yoyo on the string that you want. 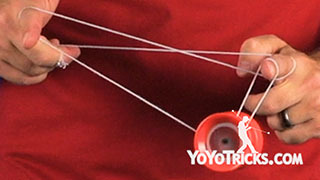 The string that you do want is the string coming right directly off the yoyo, like I said, it is the last string to go over the first finger of your opposite hand. 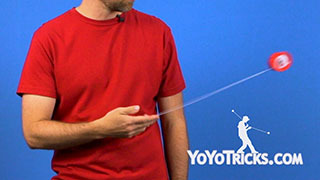 Even once you start getting your aim a little bit better and you have separated the strings, another thing that can help you with this trick is if you slow the motion of the yoyo down a little bit. 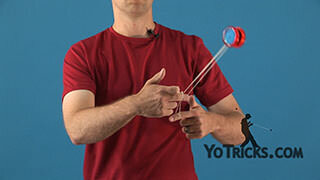 The easiest way to do that is to bring your hands down after the yoyo passes by the first finger of your yoyo hand. You can see that if you do that enough, it will actually stop the yoyo dead in its tracks. 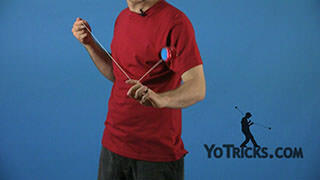 If you allow the yoyo to keep moving, you are going to want to move your hands back up before the yoyo goes over the first finger of your opposite hand. You can see that give you a little bit more time to think about what you’re doing. 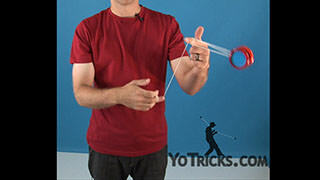 Then you can aim to get the yoyo onto the right string. Once you are better at the trick you do not need to slow it down at all. You can see you will eventually get to a point, pretty easily, where you can just land it on the string that you want it to. Of course, that will take some practice, but once you have it down you will see it’s not as difficult as you might think at first. Once you have the trick down, you are going to want to work on the dismount. 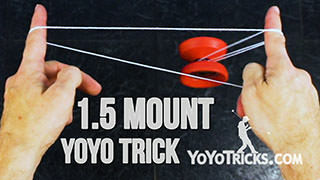 Probably the easiest dismount is to just reverse the motion of the yoyo. All you have to do to do this is just lift your hands a little bit and then drop your opposite hand down. You can see that the yoyo just swings right off the mount. If you want to get a little bit trickier with it, you can always try to swing it right back into a Trapeze. 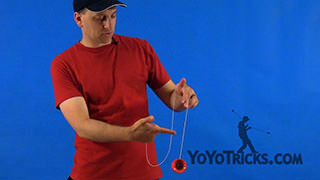 Another thing you can do if you have a responsive yoyo, is you can toss the yoyo straight up, and then it will just wind up right back into your hand. 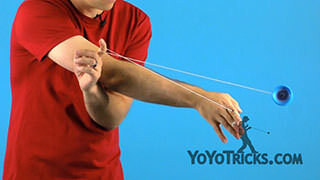 When you do that you will have to let all of the strings off of your fingers, so you are just going to want to curl your fingers in a little bit, that will release the strings so that the yoyo can come back. 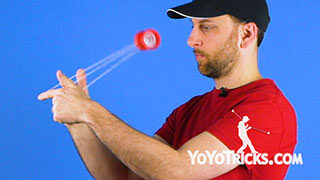 If you have an unresponsive yoyo, obviously the yoyo is not going to come back that way. 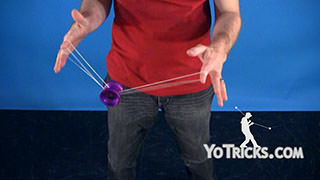 What you can do in this case you can just let the outside strings come off the first finger of your opposite hand, and then let the string come off the first finger of your yoyo hand, and if you pull your hands apart then you can land the yoyo right back into a Trapeze. This one is a little bit more difficult, but it is also a little bit more exciting, and it leads better into combos. 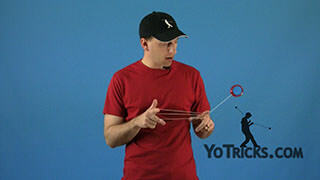 As you can see, you can also do that with a responsive yoyo. 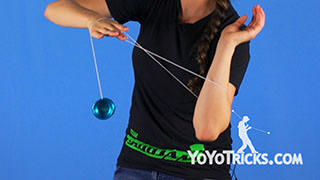 The key to making it work with a responsive yoyo is to have the yoyo’s spin slow down a little bit, and another thing that helps is if you toss the yoyo off toward your yoyo hand a little bit, that will keep the slack from getting eaten up in the yoyo, so that you can land it without the yoyo coming back on you. The main way that people typically dismount from Double or Nothing, looks like this. That is called the fly-away dismount. 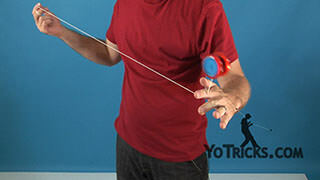 In order to achieve this, all you are going to do is drop the string off the first finger of your opposite hand, but if the yoyo is spinning quickly and you drop it when your hands are spread apart, there is a good chance that the yoyo will actually come back on you. 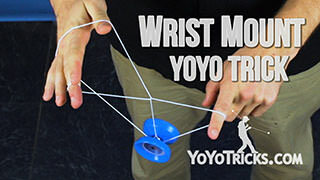 In order to keep that from happening, if you’re having that problem, just bring your hands together a little bit, and drop the string off the first finger of your yoyo hand, then you can complete the rest of the motion. 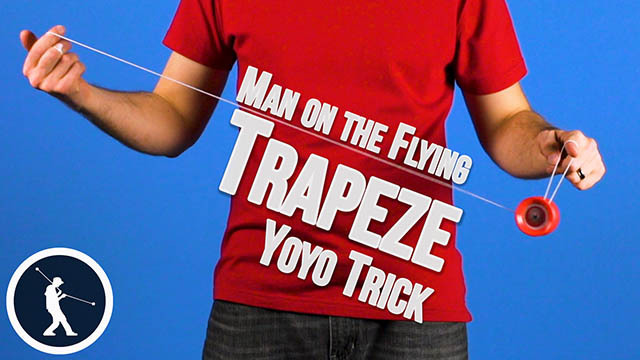 All you are going to do once the yoyo is here, is you are going to swing the yoyo toward your body, and around your opposite hand, and you can see that gets you right back into a Trapeze. 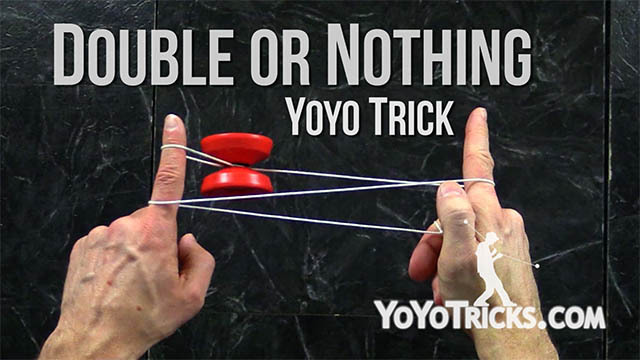 There is a lot of different stuff that you can do with Double or Nothing, once you learn it, it is the foundation of a whole lot of different combos, so we definitely recommend that you get into it and perfect it. So that is Double or Nothing.